Bardejov Town Conservation Reserve is an intact example of a medieval town that was located on a major Central European trade route. The town was first mentioned in writing in the 13th century. It played an important role in the trading network from Baltic Sea to Black Sea. The designated area is located inside the fortified city walls, which have been preserved for a substantial part. Landmark sights are the Gothic St. Egidius Church, the Town Hall and the dozens of burghers' houses that adorn the central square on three sides. The lay-out of the town centre is still original. The small Jewish quarter with its Great Synagogue was later added to the nominated area on the advice of ICOMOS. 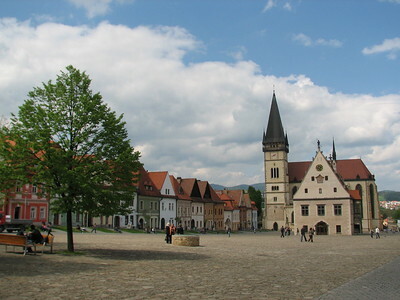 The first view of the central square of Bardejov is really stunning. It's perfect in many ways: consistency, size, colouring, state of repair. And oh, let's not forget that pretty ensemble of the St. Egidius Cathedral and Town Hall. The whole also looks a bit out of place here in Slovakia: it could be located in Poland, (East) Germany or some Hanseatic city. It even reminded me of my home town Gouda in the Netherlands (which also has a prominent, stand alone 15th century Town Hall on its City Square). I roamed around for a while taking in the scenery and visited the St. Egidius. The lady in charge of selling tickets (and souvenirs) did so with an attitude as if we would gain entry to the Vaticans' St. Peter's Basilica itself. This interior is less imposing though. It looks smallish and chaotic, probably because it's filled with ancient altars with panel paintings. These altars are deemed very precious but probably not to everybody's taste. As mentioned in the review by Christer Sundberg below, restorations have been carried out very well here. It's by far the best restored site I've seen so far in Slovakia, on par with the better ones in Poland and the Baltic states. The inscribed area is rather small: the old town within the city walls plus the Jewish suburb. Bardejov is a good base though for other sights in the vicinity like Bardejov Spa and the numerous wooden churches that are scattered in the border area with Poland (a possible new / extended WHS later this year). Bardejov historical center belongs to places that I like in eastern Slovakia, and I visit it at every opportunity. 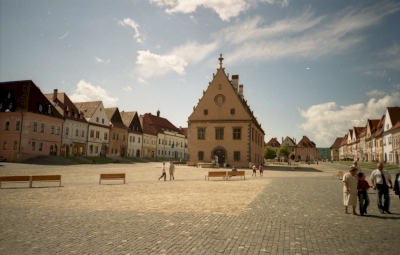 Though result of extensive restorations to medieval appearance (especially roofs of townhouses), I do not take it as a tourist trap.The old photo (from 2003) shows a view on the central square with municipal house in the middle. One side of the square is formed by late gothic St. Egidius basilica. The interior contains the set of late gothic sculptures. However, even more prominent sets of wooden scupltures can be found in nearby Levoča and Spišská Sobota. It is a pitty that I have not visited the Jewish quarter yet - maybe next time. I heard that it is finally reconstructed after many years of neglecting. Bardejov is a sleepy small town not far from the border with Poland, we visited the WHS in August 2014. The inscription is based on the almost completely preserved medieval town plan. And indeed the rectangular market square is quite lovely, surrounded by well-preserved town houses, a small town hall in the centre and the parish church of St Egidius at the front side. It does not take much time to properly visit the site: a stroll around the market square, a visit to the church, and a walk along the preserved city wall on the east side of the town. The best part of our visit was the climb to the church tower. From up there you have a wonderful view and you can see the medieval layout of the city. I hardly remember the interior, after all the wooden churches we were a bit tired of visiting churches. Bardejov is a pretty town, but there are similar sites on the WH list that I liked more: Levoèa which we visited the next day, and especially Telc in the Czech Republic. In the evening the city fell into a deep sleep, we had the market square almost to ourselves, the tables in the few cafés and pubs were almost empty. Finally, we found a restaurant for dinner in one of the back streets. Next morning we went to the Jewish suburb, it is just a few hundred metres from the town centre. The complex is small, it consists of the former ritual baths, the synagogue and an assembly hall, next to it a Holocaust Memorial (not within the core zone). The nomination file describes ideas for a comprehensive refurbishment of the area and the establishment of multiple cultural uses, but nothing has been realized so far. The mikvah has been renovated, but it houses a hardware store. The other buildings are in bad repair (photo). 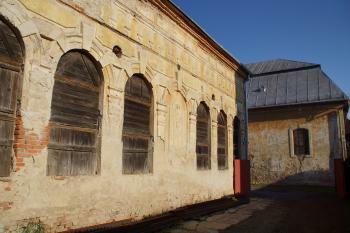 The photo shows the outer wall of the assembly hall and the synagogue in the background. Construction materials and equipment are stored in the yard, but that seems to belong to the hardware store and not to ongoing renovation works. A look through the window of the synagogue gave us a glimpse of the vaulted ceiling and remains of wall paintings. The complex could be a significant component of the WHS, but the current state is a pity. It would be interesting to read in future reviews how they proceed with the area. I visited this WHS in September 2014. While driving round Lesser Poland, close to the Slovak border, I couldn't resist the temptation of visiting the nearby WHS of Bardejov as a half day trip. The first thing I saw as I approached this town was the restored small bastion and the remaining city walls. The core of this WHS lies in Radničné námestie or Town Hall Square. The Basilica of St. Egidius is worthwhile visiting, mostly for the spectacular views from the bell tower. This was definitely the highlight of my trip as I could appreciate how most of the medieval layout remained intact. That said, it carries quite an expensive price tag for what you get to see (2.50e to visit the church, an additional 1.50e to climb the bell tower and an extra 2.00e for photography). The town hall in the middle of the square now houses a museum. 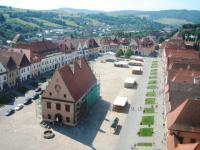 Once I saw the town hall square I immediately felt that Bardejov was really quite similar to Gouda in the Netherlands. Perhaps I was getting hungry and so to make sure this was no longer the case I stopped to have a light snack at one of the square's cafeterias. All in all I'm happy I visited this WHS but I wouldn't have bothered had it not been so close to other WHS in the South of Poland. Maybe I'm not doing justice to this place, but I wasn't very impressed by Bardejov. I just had about an hour to spend there, so I could just walk around the main square. The square, the town hall, and the big church are rather nice, but I'm really not sure if they are that special. There doesn't seem to be a lot to see or do here except taking a stroll around the square. Crossing over the border to Slovakia from about Tarnow in Poland brings you to the small town of Bardejov, right by the foothills of the Beskydy Mountains. Its actually not a small town with its 30.000 inhabitants but the Old Town is and could be visited in an afternoon, or as I did – enjoyed for a couple of days. There is quite enough to see and do in Bardejov including Bardejoveske Kupele, a small spa town just 4 km north of the town to last you here for a few days. In the latter you can also drink the healthy, mud-smelling mineral water and become a new man or woman overnight. The Old Town and the World Heritage Site of Bardejov consists mainly of a rectangular square, with small two and three-story merchant’s houses on the long sides. In the middle of the square stands the beautiful Town Hall, a relic from the 15th century when trade between Poland and Russia made Bardejov a rich town. The 84 old-town houses as well as the Basilica of St Edidius was repaired between 1970 and 1990, an undertaking that alone makes up for the World Heritage appointment in my opinion. At the time of my visit to Bardejov (2006) things was still utterly cheap in Slovakia and in Bardejov in particular. You would be quite surprised if I told you in detail about costs for accommodation and food in Bardejov. For a Scandinavian used to high prices it’s was just to enjoy and for some reason it made me feel like I was one of the Swedes robbing Bardejov blind during the Thirty Years’ War. 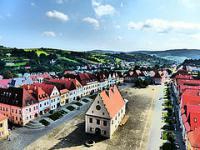 If you´ll visit it, then also visit Bardejov Spa, it´s not to far away and it´s very calm and amazing place. Built in the 14th century: "In the mid 14th century Ludovit I ordered the citizens to fortify the town. The entire defensive circuit was completed" (AB ev), Church of St. Egidius (15th) and Town Hall (early 16th) are some of the later additions.